Philip Andrews designs and crafts his farm tables using traditional woodworking techniques from the 1700 and 1800s. All farm tables are hand planed, hand sanded and hand painted or stained. 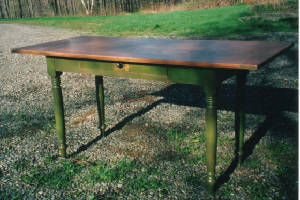 Tables have a lift top secured by turned wooden pins and a mortised and tenoned base to maintain strength and stablity. Tables can also have 1, 2 or 3 drawers for extra storage space. All tables are crafted with comfort in mind, so everyone's dining experience is spacious, not cramped. Farm tables can be made to seat up to 12 people. Philip will design a table to meet your specific diminsions and will finish your piece as requested. 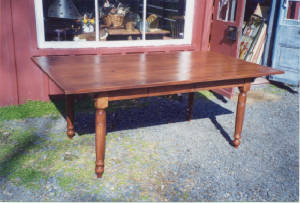 Farm tables can be made with Cherry, Pine, Poplar, White Ash, Oak or old wood. Deliveries can be made within a 200 mile radius of Gillett, PA for a minimal fee of 100.00. Cost of delivery to areas outside of this radius will be determined upon ordering. 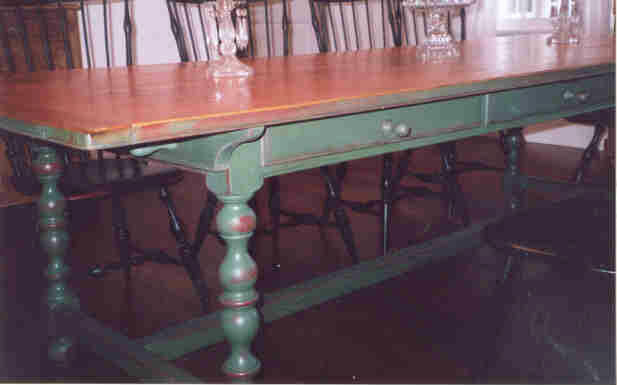 Hand-crafted, antiqued pine top farm table with breadboard ends, a hard-wood stretcher base and custom turned legs. An Old Pine stain finish completes the top and a Venetian Red paint covers the base. Table dimensions are 39 wide X76 long X 30 tall. 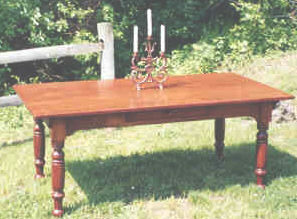 farm table with turned legs and table top made out of old wood and breadboard ends for that authentic farm table feel. 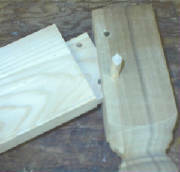 All joints are mortise and tenon and pegged with glue blocks on inside corners. Hand planed is 1 1/8 inch thick. Table has adequate clearance under the apron for comfortable dining.